Paula is a performance maker and arts educator passionate about supporting emerging practitioners and the development of original work. She regularly teaches performance and devising skills workshops for the Victorian College of the Arts Foundation and short course program in Melbourne. She is a core tutor on the Melbourne University curriculum subjects ‘The Actor’s Process’ and ‘Improvisation: Space, Text and Action’. 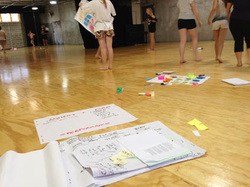 For five years Paula taught the solo-self devising project ‘Lifepaths’ for Verve Studios and currently has returned to her hometown of Wellington, NZ, to do some teaching at Toi Whakaari: NZ Drama School. ​ Praised as a supportive and passionate performance teacher Paula’s unique expertise in creating original work has been forged over 20 years of professional experience. Paula plants the seeds of ideas and provocations, it’s up to you to allow your playfulness and curiosity to allow it to come to fruition. Mistakes and failings are welcome. Paula’s style of facilitation is flexible and she’s generous with her time and knowledge. She reads the energy in the room very well and knows how to maintain everyone’s attention and enthusiasm. Paula is warm, enthusiastic and encouraging. She is the perfect tutor in helping you learn to take risks and be brave in forging your own creative path. For this independent acting school I’ve taught the term-long course component on creating an original solo performance based of self, identity and life experiences. I work with both the dance and animateuring postgraduate students in the realisation of their assessed performance projects. Through Paula’s creative facilitation I feel I’ve experienced several significant ‘light bulb’ moments. I’ve found my confidence to create unique, honest and original works that has developed my skills as a performer and a creative person. Paula is absolutely excellent! I am usually very cynical about ‘abstract movement’ and all that, but she completely changed the way I look at different types of performance making. The Collective by Jean Betts (2010) VCA Foundation Studio 11. Suitable for all live performance practitioners – actors, playwrights, dancers, performance artists and musicians - who want to explore how to generate original material in a supportive environment. Explore some methods for making your own creative process come to life. Drawing widely from design-thinking, improvisation and process-focused art methods find a way of making that suits you.